* Not a coconut fan? There's another tip at the bottom! Upon moving to Seattle, we were surprised to hear that one of the city's famous desserts was the Triple Coconut Cream Pie from restaurateur Tom Douglas' Dahlia Lounge (you may recognize the restaurant from the timeless classic Sleepless in Seattle). 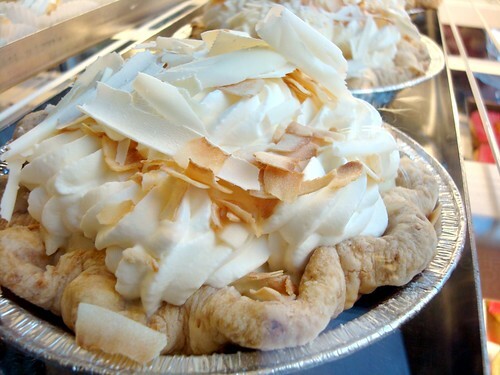 Our wariness was twofold: first off, while a good dessert, coconut cream pie has never been a major player in our dessert vernacular, more often something that we'll eat because it's there, a second or third choice at best. 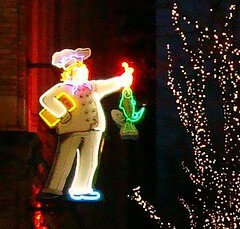 And second, did we really trust a restaurateur who had a neon sign in his own image boldly hung outside of the restaurant? Was it a gesture of self-deprecating tongue in cheek humor, or just plain ego? And so, two years of residence passed before we even tried this pie, which has been their bestselling dessert for over twelve years. But oh, to think back to the day we finally did try the famous pie. As will happen from time to time, a baked good is so well-made that even if it's outside of your general taste preferences, it will make you a believer. The taste of fresh whipped cream, laced with vanilla and coconut, is the first taste that hits you: rich, creamy and decadent. At an indeterminate point, the whipped cream ends and the pie filling begins, filling the mouth with a custardy, indulgent cocunutty taste; that gives way to a light, flaky pastry crust, also infused with coconut--all summing up to make you think that maybe, just maybe, becoming morbidly obese on this stuff wouldn't be so bad at all. Their restaurant portion will satisfy Herculean appetites; servings for all appetites can be found next door at the Dahlia bakery: from mini individual "bites" to larger sizes depending on how big a crowd you're feeding (or, you know, how hungry you are). 1. To make the pastry cream, combine the milk and coconut in a medium saucepan. Scrape the seeds from the vanilla bean and add both the seeds and pod to the milk mixture. Place the saucepan over medium-high heat and stir occasionally until the mixture almost comes to a boil. 2. In a bowl, whisk together the eggs, sugar, and flour until well combined. Temper the eggs (to keep them from scrambling) by pouring a small amount (about 1/3 Cup) of the scalded milk into the egg mixture while whisking. Then add the warmed egg mixture to the saucepan of milk and coconut. Whisk over medium-high heat until the pastry cream thickens and begins to bubble. Keep whisking until the mixture is very thick, 4 to 5 minutes more. Remove the saucepan from the heat. Add the butter and whisk until it melts. Remove and discard the vanilla pod. Transfer the pastry cream to a bowl and place it over a bowl of ice water. Stir occasionally until it is cool. Place a piece of plastic wrap directly on the surface of the pastry cream to prevent a crust from forming and refrigerate until completely cold. The pastry cream will thicken as it cools. 3. When the pastry cream is cold, fill the prebaked pie shell with it, smoothing the surface. In an electric mixer with the whisk, whip the heavy cream with the sugar and vanilla on medium speed. Gradually increase the speed to high and whip to peaks that are firm enough to hold their shape. Fill a pastry bag fitted with a star tip with the whipped cream and pipe it all over the surface of the pie, or spoon it over. 4. For the garnish, preheat the oven to 350°F. Spread the coconut chips on a baking sheet and toast in the oven, watching carefully and stirring once or twice, since coconut burns easily, until lightly browned, 7 to 8 minutes. 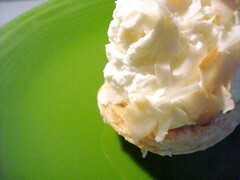 Use a vegetable peeler to scrape about 2 ounces of the white chocolate into curls. Cut the pie into 6 to 8 wedges and place on dessert plates. Decorate each wedge of pie with white chocolate curls and the toasted coconut. If not serving immediately, keep the pie refrigerated, covered with plastic wrap. The finished pie should be consumed within a day. Prepare the garnishes just before serving. The coconut pastry cream can be made a day ahead and stored chilled in the refrigerator, covered with plastic wrap as described above. Fill the pie shell and top it with whipped cream and garnishes when you are ready to serve the pie. Recipe borrowed from Books-for-Cooks.com, Copyright © 2002. 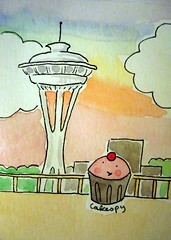 Of course, if you're not a coconut fan, we are also huge fans of the cupcakes at Dahlia Bakery. True Story: one time while walking up to the door, we walked into a girl and guy coming out. 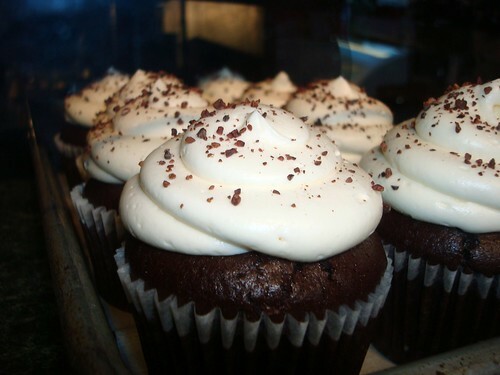 Says girl to guy in a vaguely sensual voice and through a chocolate-flecked mouth: "Oh my god this is the best cupcake I've ever tasted" -- and then her eyes kind of rolled back in pleasure. We'll have what she's having, please. 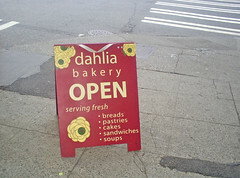 Dahlia Lounge and Dahlia Bakery are located side by side at 2001 4th Ave., Seattle; check them (and Tom Douglas' other restaurants) out at tomdouglas.com.